Today (August 17) my latest book was released. "Becoming Frozen" is my own story about falling in love with Alaska, after a rash decision to follow my then-boyfriend to the North completely changed the trajectory of my life. The release coincides with the tenth anniversary of that decision, which was set in motion during the week of my 26th birthday. Coincidentally, I was camping in the Wind Rivers in Wyoming when I had my fateful "why not?" moment, and I hadn't been back those mountains since, until last week. It's funny how life continues turning in circles. Books, however, remain my ambition. I had some encouraging success with "Be Brave, Be Strong," and initially felt confidence that I could bulk up my fish wheel with frequent releases and modest sales, similar to other independent authors I admire. It hasn't quite worked out that way, mainly because I find book writing to be frustratingly difficult. Blogs are a breeze. But books ... they tend to take on a personality of their own that isn't always agreeable. 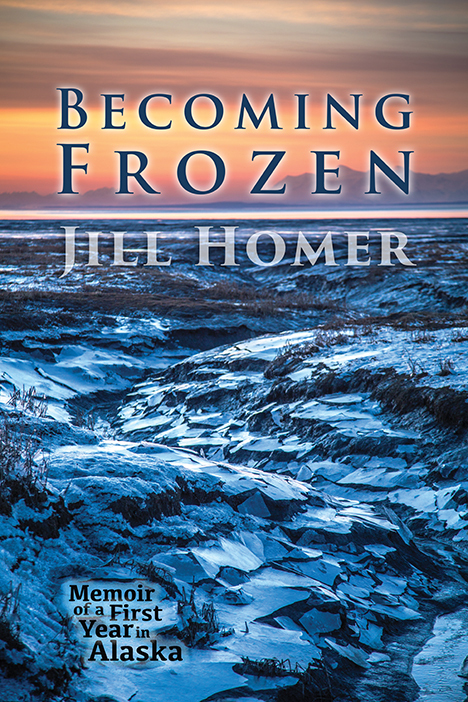 I struggled with "Becoming Frozen." I'll admit that right here. It will be interesting to watch how it's received. Books are also a challenging market. I saw all this potential with the rise of independent publishing, and it has worked out for me to some extent. I've sold more than 20,000 copies of a book that an agent told me she "loved, but there's no market. Nobody reads books about bicycling." I have three other books that have had reasonable sales. Still, it's difficult to convince people to part with their money for what amounts to low-tech entertainment. So much highly entertaining content is available for free. Even I am guilty of buying and reading only a dozen or so new books per year, and spend many more hours reading newspapers, online magazines, and blogs. I think that's what I struggle with the most in my for-profit projects. Why should/would anyone pay for this? I've also ventured back into the traditional publishing game to pursue a project about Ann Trason. I've already found a couple of interested publishers, but each has a specific idea of what that book should be. Meanwhile, both my and Ann's ideas about the book continue to shift, and I feel like I'm approaching an impasse. In all honesty, I have no personal interest in traditional publishing. The validation of it does nothing for me, the numbers I've yet seen are not inspiring, and the micromanagement is exasperating. And yet for projects like this one, and others I have in mind, it's really they only way to go. What's funny about writing is, I don't really believe people should pay me for this. I enjoy writing as much if not more than cycling, and I don't expect to receive payment for the cycling I do. But I do need income, to at least a small extent. Also, Beat is waiting for me to create a million-dollar bestseller so we can retire and move back to Alaska. I tell him I'm way too out of touch to formulate such successful content. I write about what I love. It's pretty esoteric. I'm okay with that. It can still fund groceries. For everyone else, your support is greatly appreciated. I plan to offer signed copies, but I've nearly sold out of what I'll have available before early October. I'll post that link then, but for now you can purchase an eBook (with a free app the file can be read on any device) or paperback at Amazon. Thank you to Tonya Simpson for editing, and David Shaw at Wild Imagination Photography for the cover photo. I've had such a great experience with the university of Alaska press that I still think traditional publishing can work. 20,000 copies rocks! I'll be buying your book. Working on my next memoir, also about Alaska, but not frozen by any stretch. Becoming waterlogged? Haha. I'm looking forward to reading your debut novel. Is it going to be available for Kindle? Congratulations on finishing another book! The cover is awesome. Looking forward to the read. Downloaded the book yesterday and I'm about 1/3 through it. Decided I better go to bed at that point since I have to work today. I'm really enjoying getting to know the younger you! Great read so far. Yay, buying this right this moment. Thanks for writing yet another, what I am sure will be a both inspiring and riveting book. Your stories are always amazing. I can't believe how much doubt you have about your ability to write sometimes. I wish you could see from our perspective how interesting and poetic your words are to those of us who still come here to read your blog posts. Keep it up girl! I preordered it so it automatically popped up on my Kindle last night. Trying very hard to finish my current book first, but I might just have to skip ahead to yours! Have enjoyed reading your first 3 books and am looking forward to reading Becoming Frozen. I like your writing style very much. Just bought it on Kindle. Looking forward to reading it. Best regards from the barren wastelands of Sunnyvale! Hey, I'm still around! Formerly known as ladyvelo, high priestess of the 27-tooth cog. I just looked to see if my old blog was still there and TOTALLY fell down the rabbit hole of reading all my own posts... haha. 25-year-old me was a whiny little bizzle, wasn't she? Ha, I remember reading your blog back then! Every time I stumble across a blog that hasn't been updated since 2007 or earlier, I'm intrigued. What ever became of the blogger? What would they think of this record of themselves still languishing in this graveyard of cyberspace? The Internet is forever. I also pre-orderd, and thanks for the notice...(I don't get into my kindle every day lately)...fired it up and downloaded automatically...NICE! (I held out in getting a kindle until just this last Dec...thought I would HATE it...but I was WAY WRONG! Suddenly I have a Gen I, a paper white AND A Fire HD...well, my wife snagged the paper-white). Jill...I think you're wrong...I think there's a huge market for E-books! I've bought more book since I got my kindle(s) than I have in the last 5 (or more) years! Though I do like the autographed copies too...kind'a hard to get you to sign a digital copy. ANYWAY...I've been reading your blog since Juneau (what year did Fatty introduce you to the world? That's when I found you...and I"'e been a fan ever since). I'm anxious to read your book, but just started a new one last week...yours is next. If it's anything like Ghost Trails or Be Brave, Be Strong it can't help but be great. Next time you're in Alaska I suggest a book signing event at Fireside Books in Palmer and an interview next door at Radio Free Palmer (KVRF). Us locals would love it! Read and loved both Ghost Trails and Be Brave, Be Strong. Will be downloading Becoming Frozen today. Love your style and insight. Thank you everyone! I appreciate your support. Sent u an email yesterday asking how I can get a signed copy. Please let me know. Tx! I'm not a blogger but discovered your blog from a Fat Cyclist reference many years ago. 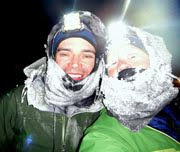 Elden mentioned your upcoming Iditarod race (your first one) and my curiosity led me to follow your adventures ever since. I get to live vicariously through your posts, as I don't have to resources or necessary will power to do some of these things. I thoroughly enjoyed my paper copy of Be Brave Be Strong and look forward to reading your newest release. Hmm, maybe it's time to get a Kindle. Just finished the book. Nice job! It looks like I can become the first to review it on Amazon! (FYI: You may want to consider doing White Mountain Peak, near Bishop, CA, by MTB. I was there in June and there was lightning at the top and I turned back. (...and perhaps work on "Becoming California"
Wondering if it will be available in ibook? Hi Darcy. My iTunes sales have always been relatively small compared to Amazon, so I am experimenting with KDP Select for six months. You can read the eBook on an iPad with the free Kindle app. If you are not interested in that, the digital book should be available in all outlets next February. I'm pre-ordering right now. I've loved all your books. Alas, I didn't discover blogs until about 2008... and that was probably when I first commented on yours. I'm quiet for long periods of time but I still faithfully read your posts! Lastly, silly engineering pet-peeve, fluorescent not florescent..